The Gripp Energy Late Models packed up and headed to the Innagural event being held at Caraway Speedway on July 28. The first six races of the season has been some of the best races, with four different winners. 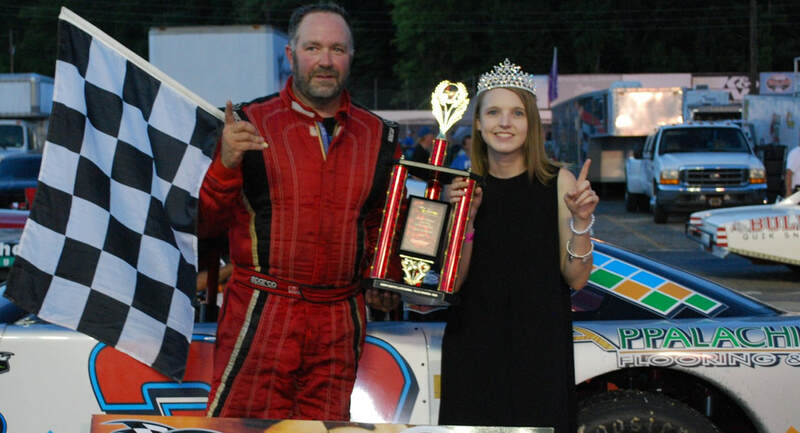 Dillon Houser from Hildebran, NC captured the first three victories, Mitchell Mote from Greenville, SC picked up one, Ralph Carnes from Anderson, SC has one victory and the latest winner Kaleb Pressley taking home the win driving Randy Ollis's car at Tri-County Motor Speedway. The points battle is starting to take shape Houser who currently leads the battle, is catching heat from Marshall, NC's own Jesse Clark. Clark who has been so close to capturing his first victory this season. The sun began to rise in the valley across the small town of Sophia, NC, the teams arrived bright and early to take advantage of the early morning practice session. Local standout Josh Lowder showed up to compete with the stought competetion. The 0.455 mile oval has some long straight aways but tight corners so the drivers knew they had to be on their game for the race. Houser topped the speed charts for the first round of practice followed by Josh Goble and John Gallman. They headed back into the pits to tweek on their machines and get ready for the final round of practice. When they returned back on track it was Houser's team mate Chris Phipps, found his way on top of the charts. Houser, and Goble rounded out the top three. Qualifying was up next, the drivers went through tech, and returned to pit road to roll out. Lowder claimed the Renegade Race Fuels Pole Award, and rolled a four on the invert dice. Phipps was now in control of the field, he followed the pace truck around the track and waited for it to duck down on pit road. The flagman waited for the drivers to come out of turn four, and the race was on. Phipps quickly took off and jumped out front. Lowder who started in the rear of the field quickly picked off the drivers one by one until he found himself in the second position behind Phipps. A four way battle for third developed between Goble, Houser, Clark and Gallman. Houser was able to capture the third position bringing Clark with him. The race went caution free for the first time this season, Phipps was able to capture the win by default. He was followed by Clark in second, Houser third, Gallman fourth, and Goble rounding out the top five. The Series will head back down to Anderson Motor Speedway one final time this season on August 18th. Houser maintains the points battle coming out of Caraway but Clark made some ground.